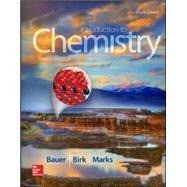 Introduction to Chemistry, 4e by Bauer/Birk/Marks offers today's student a fresh perspective to the introduction of chemistry. This textbook offers a conceptual approach to chemistry by starting first with macroscopic phenomena, and then presenting the underlying microscopic detail. Each chapter opens with a real-life scenario that helps students connect abstract chemical concepts to their own lives. The math found in Introduction to Chemistry, 4e is introduced on a need-to-know basis, with "Math Toolboxes" in select chapters to help support the math skills required in that chapter.